The Espetada Regional or Espetada Madeirense is a traditional dish on the island. Some even claim that it is the most typical dish of Madeira! Many decades ago, people waited for a special event, a festivity or an arraial (pilgrimage) to eat espetada. They gathered in groups and ate espetada with friends around a big fire. It was uncommon then to eat beef at home on a regular basis. We must wait for the late 1950ies to see espetada regional in restaurants. Rumor has it that it was a restaurant in Estreito de Camara de Lobos which first included this dish in its regular menu. Most restaurants followed suit quickly and you can nowadays find this emblematic dish nearly everywhere on the island. Beef (200 grams per person) – Prefer tender, juicy and marbled meat. 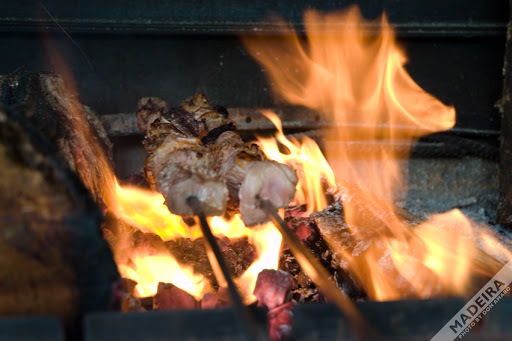 Start the fire / BBQ – the espetada is cooked over hot embers (from non-resinous wood) and not in the flames. Cut the beef in cubes of about 4 by 4 cm – adjust size of cubes to fit on the skewers. Mix the crushed garlic and crushed, bay leaves with the salt – This releases the flavors. Put this espetada mixture in a bowl and cover. Slide meat unto laurel spits leaving some distance between the meat cubes. 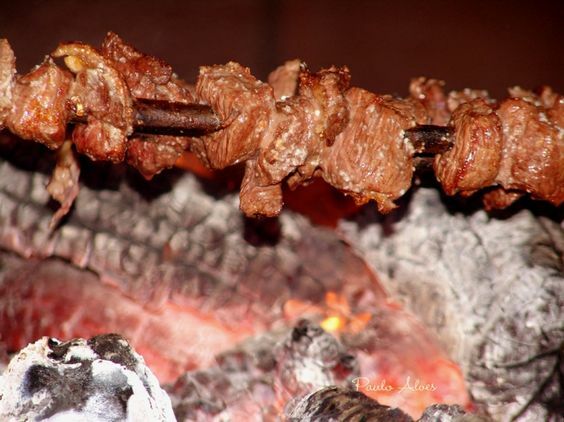 When embers are hot (and only then) generously rub the espetada mixture all around the meat skewers. Place spits above the embers of your fireplace / BBQ immediately and before the salt melts. Rotate skewers and cook to your liking. You can eat this simply with a “bolo de caco” with garlic butter (if you are outside, during a picnic, or even at home) or accompany it with a salad, small potatoes, fried corn cubes or fries. A good glass of red wine will round it off beautifully.